The 203 K is a fabulous program. Dismiss the industry lies that their hard to do. Your instructor Andy Thaw has been originating, managing and funding FHA 203 K loans for over 35 years. His expertise in origination also includes underwriting and funding of 203K loans. corporate discounts can benefit you. Call 888-254-3431 or garryt@capinst.com for details. Videos Are Worth A Thousand Words! Listen to Andy as he introduces the FHA 203 (k) training and the benefits. The video training is so detailed you’d think you were at a live event. Andy Thaw is the most experience FHA 203 (k) trainer in the country and he’s had over thirty 33 years of experience backing his reputation. We are very happy to announce that Andy is returning to Capstone Institute as a Senior Visiting Instructor. He is the author of your training materials and your instructor. Andy Thaw has worked in the Mortgage Banking Industry for over 32 years and has worked mainly in loan originations and business development. For much of his career, his primary focus has been working with FHA and FHA 203k lending and has widely been considered an industry leader in 203k financing for the last 22 years. 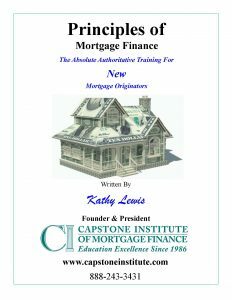 With a previous background in public education, Andy had been introduced to the Capstone Institute and became the author of Capstone’s original and widely used book “Understanding 203k Financing”. Since that time he has worked as an industry educator with Capstone where he and Kathy Lewis, the owner of Capstone, have formed a wonderful long‐time relationship through today. numerous industry publications and “best practice”curriculum. Andy has been a featured FHA speaker and trainer at countless industry events around the Country. He is currently Vice President of Renovation Lending for Mid‐Island Mortgage Bankers, an originating seller/servicer for Fannie Mae, Freddie Mac, and Ginnie Mae. His main focus is in the development of Renovation Lending through Retail and Wholesale channels in 19 states. One of the primary reasons for his success as a 203 (k)trainer is his ability to explain away the confusion in originating and processing these loans. Once Andy shares how to do it the easy way you’ll be thinking why you didn’t do this sooner. Yes, you’ll have to make some investment of your time to learn the details but after closing your first few loans you’ll be happy to tell your competition that it was very difficult and it was exhausting to get the loan to close. When they ask you again you can tell them the same story, but just don’t let them see you depositing your commission check. 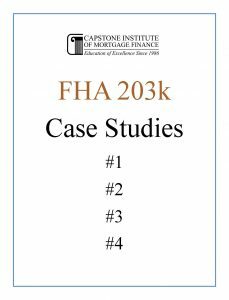 Become the FHA 203(k) Specialist In Your Area. Let your Realtors, and home improvement companies know they have you as new financing source to offer their customers instead of paying cash. * Repair and upgrade their existing homes to include damages caused by violent storms and accidents. training classes by offering down load files that can be lost or corrupted. The online self-paced training is broken down into 3 video lessons, followed by 4 separate case study lessons. 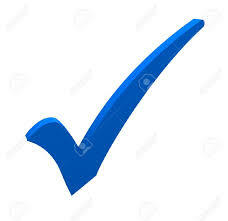 Students will receive their “Certificate of Completion” after passing their final test. During your registration, you’ll choose a username and password to enter into your online video training. When your materails arrive, just return to our webiste and go to the “STUDENT LOGIN” and enter in your pre-assigned user name and password. Your classes will now be dispayed for you to choose from. If your company would like to schedule a private webinar please call us and well share with you our available training dates. Webinars require a minimum of 15 staff with a maximumn of 30.
and that is synchronized to your video training. Shipping charges are always included with your purchases.